Language has always provided us with new ways to learn from and communicate with each other. While there are thousands of vocal languages represented from the many languages around the world, one that is gaining popularity and deserves recognition in the U.S. is actually a visual language: the American Sign Language. 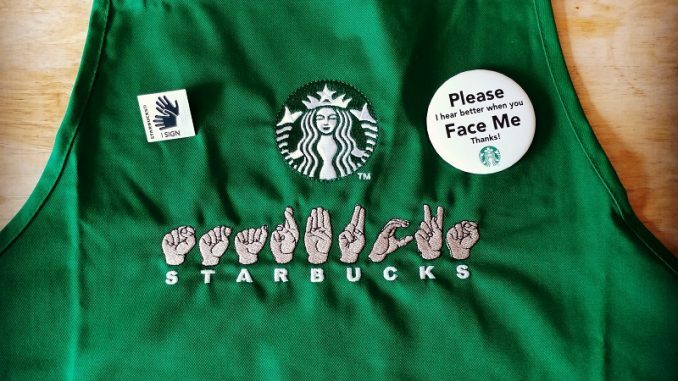 Starbucks, a worldwide coffee phenomenon, has been open about their usage and interest in incorporating ASL in their various locations. As of October 23, 2018, the first signing Starbucks in the nation has opened in Washington, D.C. The location of the store is important to note as well, as it is purposely close to Gallaudet University, the world’s only liberal arts university for the Deaf and hard of hearing. While it might appear to be just another ordinary coffee shop, as part of the chain we’ve all grown to know and love, at this particular location, every employee is fluent in ASL, with finger spelling written on aprons and menus. There is an ASL word of the day, with the signing of said word. Tablets are provided for those who prefer to write their order. The implementation of new technology, such as tablets, also allows for baristas to ask and answer questions pertaining to the order, giving signing customers an outlet to two way communication. The space is set purposely in consideration for the Deaf community, in regards to visibility, such as brighter lights and matte surfaces to reduce glare. There is a lot of art that incorporates different hand signs. Additionally, there are also many forms of technology that will allow customers to be more specific with their orders, while also having greater insight as to when their order has been completed. 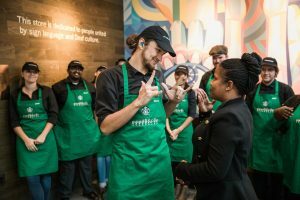 Even if you can’t get to D.C. to check out the store, there are still more ways you can support the Deaf community and support Starbucks’ in their initiative! SUNY Oneonta offers an American Sign Language course (ASL 101 and 102), and there are many apps such as “The ASL App” that provide clear tutorials for those interested in learning the trade of unrestricted communication.